A hallmark of our work is weekly user-testing with real kids in school, after-school and home settings. We produce a wide array of original character illustration and animation. 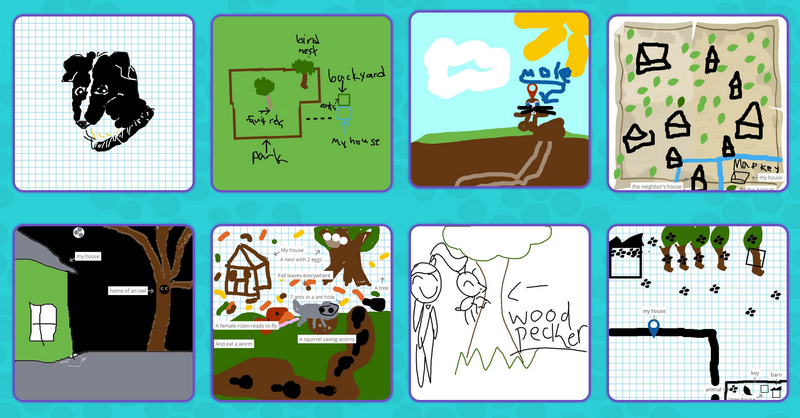 We provide many kinds of digital tools and apps to allow kids to create and safely share hundreds of thousands of drawings, photos stories and ideas. These are all carefully curated by WGBH staff before publication. We are increasingly reversioning videos, games and whole sites (and creating new ones) for ELL and Spanish speakers. We now have over a dozen apps at iTunes and Google Play. Research and development continues on many new technologies and platforms. Co-development of public media with parents through hackathons, with funding support from the Corporation for Public Broadcasting. We have developed a rich array of audio-input and gesture-input games. Players yell, jump and wave to interact with games online or on mobile devices. Collaborative game for FETCH! with Ruff Ruffman. Math fun for kids 6-9. A co-production with PBS KIDS and Coco Studios. We also create IRL games to complement our digital work. These range from high energy, outdoor science games, to indoor maker projects. Custom games, comics, and teacher materials for classroom fun. Designed for any web-enabled interactive whiteboard. WGBH Digital Kids team members can often be found presenting our work at some of the nation’s games and education conference. In this example, we have created after-school curriculums to teach environmental science. WGBH is an Educational Foundation. Everything we produce has strong educational goal and expert advisory input. This bilingual site for kids helps patients to Boston Children’s Hospital prepare. Also pictured are games from Stepping Stones Museum in Norwalk, CT and Kansas City Chiefs’ new exhibition hall. Partners on related medical projects include Dartmouth College, Tufts University, and Boston Medical Center. Many of our projects put cameras and augmented reality tools in the hands of young kids to help explore math, science and literacy in innovative ways. Our work is featured in many published books, college texts and research papers. Many of our brands have a robust presence in social media. ARTHUR has over 1 million fans.